For the ancient Irish people, the sky was a screen on which they projected their most profound speculations and spiritual needs and thus it is reflected in their symbolic art. 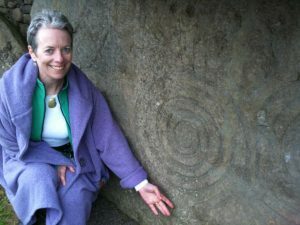 The symbols at Newgrange, Knowth and Dowth, Ireland particularly intrigue and inspire me to express and communicate their secret language in my own art. In my research, I have found these symbols to be universal expressions of humanity and it is upon that premise that I feel moved to create what I feel to be the magical talismans and amulets that you see on this site. Though born and educated in Ireland, my true fire and passion for bringing the ancient symbols of my native Ireland to life emerged while I was living in New York City. I studied at the Jewelry Arts Institute, and still continue to hone my skills as a jeweler by continuously taking high-level classes and workshops with International artists. I have found my greatest inspiration at the jeweler's bench, where hands and heart are rooted in the culture of my heritage. In a past life, Deirdre was a veterinarian for thirty plus years. Now in my studio in Quechee Gorge Village, Vermont, I continue to evolve my skills and vision to celebrate their finest form in the ancient symbols that survive to tell of a pre historic perception of the earth, sun and moon's relationship to one another and the subsequent development of a calendar system. It does not seem purely by coincidence that I've discovered ancient stone chambers aligned with the sun in nearby South Woodstock. Wear my amulets with the knowledge that I put my energy, indeed my very essence, into creating them.